You can rotate the wheel to select the lens you want, then place it right in front of the phone’s camera lens. It costs $US34.95, and is available on Amazon. Sometimes your phone’s camera lens isn’t enough for the type of pictures you want to snap – whether it’s wide-angle fisheye shots or bigger zooms than what the phone is capable of. There are plenty of external lenses available for mobile photography, but they can easily get expensive, and they usually require the user to carry around different lenses that need to be swapped out. The Ztylus Revolver M Series case for the iPhone X offers an all-in-one package of six lenses, at $US35. 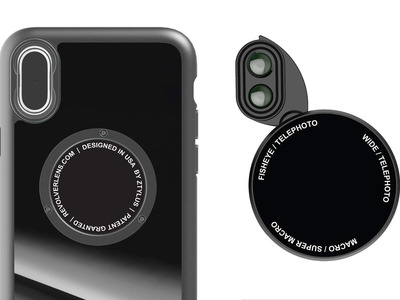 The case has a revolving wheel on the back, which contains 3 pairs of lenses: macro/super macro, fisheye/telephoto, and wide/telephoto. Instead of removing a lens and replacing it with another, you can simply rotate the wheel and extend the external lens to the phone’s existing lens. The rotating wheel is magnetic and removable, so you don’t need to have unnecessary extra bulk if you won’t be using the lenses. Because the lenses are stored inside the wheel, you also won’t need lens caps to protect the glass. However, as mobile phones weren’t necessarily intended to be used with external lenses, some image distortion can be expected. The M Series case comes in 16 colour options, and is available on Amazon.